I think The Official Adventures in Odyssey Podcast should have more free episodes. But other than that I love it! The character of Jillian Marshall has held a variety of unusual jobs - including a sous chef, surfing instructor, and even a professional line-stander. Monica Padilla (the voice behind Jillian) has a variety of unusual life experiences and she shares those with us. Writer/director Marshal Younger talks about "Between Camp and a Hard Place," where he got his ideas for camp stories, and whether he was ever in a hard place during production. Writer-director Kathy Buchanan and sound designer Christopher Diehl journey to Africa (in one case, literally) for the latest Club exclusive adventure "In a Sun-Scorched Land." Plus, hear a preview of "Between Camp and a Hard Place." January 16, 2019: Why did David Parker change actors? Who are Morrie's parents? Will you bring back the Inspiration Station? The Odyssey team answers your questions! The John Avery Whittaker Award honors people who have impact on the faith of those around them. Samantha nominated her “mama” Robin Berns. Robin brought Samantha into her family during a difficult time and made a lasting impact on her life. Hear both of them tell their story and hear their advice on how to act like Whit. December 19, 2018: FREE EPISODE: "Gone Fishing," a Focus on the Family drama from 1986! Merry Christmas! "Gone Fishing," one of the early dramas Focus produced, featured two actors who would later become familiar names on Adventures in Odyssey: Chuck Bolte and Hal Smith. Chuck Bolte was executive producer on the show during the majority of its first decade and Hal Smith, of course, became the first voice of John Avery Whittaker. Hear this drama that helped lay the foundation for Adventures in Odyssey, plus some special memories from Chuck. December 5, 2018: Writers Bob Smithouser (yes, Bob Smithouser) and Phil Lollar (plus surprise guest) dive deep into "Out to Sea"
October 10, 2018: Get in the Christmas season early this year in an unexpected way: going inside a prison. Plus: Preview Album 65! Patti Hammonds, senior manager with Angel Tree, tells us how the Club adventure "Beyond Repair" reflects real life and tells true stories from Prison Fellowship. Plus, hear a preview of Album 65: Expect the Unexpected! September 26, 2018: Hear the first chapters of "Young Whit and the Traitor’s Treasure" read by Andre Stojka, voice of Whit himself! Something sinister happened decades ago to disgrace the Whittaker name. Can ten-year-old Johnny discover the truth--and find the traitor’s treasure--before they are gone forever? Find in Book 1 of the Young Whit series. Get a preview of the first three chapters in audio form read by Andre Stojka. Plus, hear a preview of October’s Club adventure: "Beyond Repair." September 11, 2018: What's the worst thing that could happen when Buddy Norman brings his Bible to Odyssey Middle School? Celebrate Bring Your Bible to School Day with the Club story "A Predicament of Biblical Proportions," available for the first time outside the Club on September 22. Hear from writer Bob Hoose and Bring Your Bible to School founder Candi Cushman about the creation of the story. And learn how and why you can bring your Bible to school. Something sinister happened decades ago to disgrace the Whittaker name. Can young Whit discover the truth - and find the traitor's treasure - before it's gone forever? Find out in Young Whit and the Traitor's Treasure, book one in a new series exploring the childhood escapades of the most beloved character in town. And find out more about the series from the authors, Odyssey legends Phil Lollar and Dave Arnold. It’s a lovely day at the track and we got a lot of great contenders all vying for Avery Awards gold. And who knows? Maybe this year, one of our racers just might take home the legendary Avery Awards Triple Crown! Hear the competitors raced for "Best B-TV Sketch," "Best Actor," "Best Actress," "Best Scene," "Best Place Wooton and Penny Visited," "Best Villain," "Best Sound Design," "Best Script," and "Best Overall Episode." Congratulations to the winners and thank you to everyone who voted! August 1, 2018: Get into the great outdoors with TrailLife USA and hear from CEO Mark Hancock. Plus, come along with the Galactic Justice Corps for a preview of this month's Club adventure "Walk Worthy." This month in the Club, Buddy and Jay join a TrailLife troop in the adventure "Walk Worthy." Mark Hancock is the president and CEO of Trail Life USA and he tells us about the group, his experiences outdoors, and what he thinks of "Walk Worthy." Allison Sharpe talks about preparing for the role of Valerie, being a "scratch voice," and the possibility of redemption for the mean girl in school. Plus, she gives us tips on being an artist. Karen Ellison has been a studio teacher for Adventures in Odyssey for more than twenty years. Find out what she does, what she’s seen behind the scenes, and about her connection to several prominent young actors. April 25, 2018: United States Vice President Mike Pence, his wife Karen, and his daughter Charlotte listened to Adventures in Odyssey on car trips. Hear from Karen and Charlotte about their odyssey. April 11, 2018: From a long line of actors, artists, and entertainers, Natalie Lander (voice of Zoe) tells us about the family business and joining the Odyssey family. Natalie Lander’s dad played Squiggy on Laverne and Shirley. Her mom is an actor and photographer. Most of her other relatives are in the arts and entertainment world. Natalie talks about the business, singing as Kevin in Home Alone musical, playing a cheerleader on The Middle, and - of course - playing Zoe Grant on Adventures in Odyssey. Grayson Smith emerged as one of three finalists from among 2,316 fans who entered the second Get in the Show contest. After an audition with our Adventures in Odyssey cast, Grayson was crowned the winner by fan voting. Last November, he claimed his prize by joining us on the Focus on the Family 40th Anniversary Cruise and performing in the Odyssey live show, signing autographs, and interacting with the actors. Hear about all those experiences and more! Kay Bess isn't new to Odyssey. She played a baddie in "Between the Lines" and an elderly Irena Sendler in "One More Name." But she's new to the part of Dr. Lily Graham. Learn about her history, her roles on Odyssey, and taking over for a beloved actress and character. Diane Michelle voices Alice in "Passages: Fletcher's Rebellion," Lillia in "The Tower, and Orpah in "Three Funerals and a Wedding." Plus, she was Doctor Morton for many years and now she's the woman from Tekoa in the upcoming "David and Absalom." She's been a bunch of Odyssey episodes, but hasn't been in the spotlight...until now! December 6, 2017: When is Album 64 coming out? Will Buck and Jules start dating? Can Connie and Jason be a thing? Will Grayson Smith become a regular character? Get the answers! November 22, 2017: Happy 30th Birthday, Adventures in Odyssey! Hop in the Imagination Station and travel 30 years back to the recording of the first episode: "Whit’s Flop"
"Whit’s Flop" first aired November 21, 1987. Sound designer Bob Luttrell and host Chris Anthony were there on that special day. Hear their memories of recording the very first episodes. October 25, 2017: What do Buddy's dad, the waiter at a fancy Odyssey restaurant, and Whit's son Jerry Whittaker have in common? They are all voiced by actor Scott Whyte, who chats with us on the podcast. Actor Scott Whyte auditioned for Odyssey for years and never landed a role, but he was encouraged by his friend Jess Harnell (voice of Wooton Bassett). Scott finally was cast as Whit's son Jerry Whittaker and has voiced a number of roles since then including Buddy Norman's dad. Hear about his journey to Odyssey and how it involved Indiana Jones, The Mighty Ducks, a band named The Scott Whyte Band, and more. October 11, 2017: Travel around the world, from singing on stage with the Pool Boys in London to diving out of a plane in Nicaragua as we go behind the scenes on the season premiere, "Find a Penny." Writer-director Kathy Buchanan and sound designers Nathan Jones and Christopher Diehl talk about the creation of "Find a Penny, Part 1" and give a preview of what's ahead in "Part 2." August 16, 2017: VIDEO PODCAST: Watch the 2017 Get in the Show finale event, including auditions with the finalists and announcement of the winner! Andre Stojka (voice of Whit), Katie Leigh (voice of Connie), and Shona Kennedy (voice of Jules and 2012's winner) act alongside the three finalists for Get in the Show and crown a winner. Bob and Jesse put on a New Time-y Radio play to hand out awards for two Adventures in Odyssey albums! Hear the winners for "Best Actress," "Best Actor," "Best Sound," "Best Song," "Best Scene," "Best Comical Pair of Characters," and "Best Overall Episode." Congratulations to the winners and thank you to everyone who voted! July 19, 2017: Get "Swept Away" with writer/director Nathan Hoobler and sound designer Jonathan Crowe as they dive deep into this unique Club adventure. How do you create the sound of rain for two episodes? What does three people scuba diving sound like? And how did a real-life forest fire in Colorado Springs inspire an episode about a flood in Odyssey? Find out from the team behind the episode “Swept Away.” Plus, hear a bonus scene from the show, featuring Harlow Doyle. In this classic story from Album 45: Lost and Found, America Sings! comes to Odyssey and many hopeful singers including Wooton, Bart, Harlow, Connie, and Tamika line up to audition.. Plus, hear about the creation of this adventure from composer John Fornof, producer Marshal Younger and more. Sam Suksiri tells us about being a "writer apprentice," designing theme parks, teaching robotics to kids, winning a cooking contest, and, yes, joining the Odyssey team. June 7, 2017: Is Becky going to be a regular character? Are Wooton and Penny going to be back from their honeymoon? Will Whit ever get another villain? Get the answers! Executive producer Dave Arnold, producer Nathan Hoobler, writer/director Kathy Buchanan, writer/director Bob Hoose, and writer/director Phil Lollar answer fan questions about the recent album 62, the upcoming album 63, and what's going on in Odyssey. May 24, 2017: VIDEO PODCAST: Watch the actors sing in "Legacy"
Cast members Shona Kennedy (Jules), Karen Kennedy (Lena), Katriona Kennedy (Teena), Pat Fraley (Karno), Robby Bruce (Buck), Andre Stojka (Whit), Will Ryan (Eugene), and crew Phil Lollar (writer/director) and Christopher Diehl (engineer) record the songs for the musical episode "Legacy." May 10, 2017: Marvin Washington (and voice actor Kendre Berry) return to Adventures in Odyssey in "Unfair Game"
Kendre Berry played Marvin Washington for years on Adventures in Odyssey. His last appearance was in "A Class Reenactment" in 2008. That is...until now! Marvin returns in this month's Club story, "Unfair Game." Kendre Berry, the voice behind Marvin, lets us know what's happened since then. April 26, 2017: Pastor Wilson Knox arrived in Odyssey at the same time that Gregory Jbara arrived in the studio. Hear the story of both. Gregory Jbara is a Tony Award-winning actor who now plays Pastor Wilson Knox on Adventures in Odyssey. Greg tells us about replacing voices in a Norelco commercial, starting college with a major in physics, and recording with the Odyssey team. April 12, 2017: VIDEO PODCAST: Captain Bob, Commander Jesse, and Crewman John Doe beam down to an alien planet in search of another cast member for the Get in the Show Contest. March 29, 2017: Sound designers Christopher Diehl and Nathan Jones share more sound secrets from the historical adventure "One More Name"
From adding a dog to an empty ghetto...to putting in an ominous train whistle...to creating a manhole cover from a gym weight, sound designers Christopher Diehl and Nathan Jones share more stories from the creation of the sound effects for the story of Irena Sendler: "One More Name." March 15, 2017: Sound designers Christopher Diehl and Nathan Jones go back to the 1940s to create the sounds for "One More Name"
From using a 1940s gun...to finding an old German truck...to adding just the right wind and floors to the ghetto houses, sound designers Christopher Diehl and Nathan Jones sweat the details to create the sounds for the historical episode "One More Name." March 1, 2017: Writer/director Kathy Buchanan tells us the true stories behind "One More Name"
Irena Sendler was a real historical person. Writer Kathy Buchanan had the task of turning her life into an epic three-part Adventures in Odyssey Club story. Find out the challenges of research, writing, and cutting "One More Name." Cristina Vee voices Irena Sendler, the main character in "One More Name." Cristina tells us about working on Odyssey, screaming for video games, and being a skipper on the Jungle Cruise at Disneyland. February 1, 2017: Will Morrie and Suzu have an arc like Novacom? Why was Legacy called Exit Stage Left? Will there be a new Guide for the 30th Anniversary? Get the answers! Executive producer Dave Arnold, producer Nathan Hoobler, writer/director Kathy Buchanan, and writer/director Bob Hoose answer fan questions about the recent album 61, the upcoming albums 62 and 63, and all things Odyssey. The John Avery Whittaker Award honors people who have impact on the faith of those around them. Carri Dekkers nominated the "Whit" in her life: Coach Larry Stuckey. Out of more than 600 nominees, Larry was chosen as the grand prize winner. Hear from Carri about how Larry was her coach in the high jump and much more. January 4, 2017: VIDEO PODCAST: Breaking News! Huge scientific breakthrough for Club! December 21, 2016: FREE EPISODE: "For Trying Out Loud"
Merry Christmas! It's time for a free episode! In this classic story from Album 39: Friends, Family, and Countrymen, Wooton Bassett wants to help Edwin Blackgaard with an upcoming production. Liz Horton tries to find something--anything--she can do better than others. Plus, hear an interview with sound designer Allen Hurley. December 7, 2016: How did Wooton and Penny make it down the aisle in "A Very Bassett Wedding?" The answers are revealed. Writer/director Kathy Buchanan and sound designer Jonathan Crowe share stories from the creation of the Odyssey milestone "A Very Bassett Wedding." Writer Bob Hoose and sound designer Nathan Jones go deep into the story of the creation of "The Key Suspect" and reveal more about the new characters Morrie and Suzu. Plus, hear a preview of the upcoming Odyssey milestone: "A Very Bassett Wedding." November 9, 2016: Atticus Shaffer: From Brick on "The Middle" to Morrie on "Adventures in Odyssey"
Writer/director Phil Lollar talks tells us all about how Renee D. Carter, was inspired by Star Trek: The Original Series, her similarity to her namesake French philosopher, and why she's from Scotland. October 12, 2016: Podcast 10th anniversary: Hear all about our hosts! Bob and Jesse are the interviewees in this special edition! It's time to turn the tables! Andrew, JD, and Roy from Audio Theatre Central interview our hosts Bob Smithouser and Jesse Florea about their stories. It starts with coming to Focus and leads to their experiences with Adventures in Odyssey and reflections on doing more than 260 Official Podcasts. Buddy Norman just moved to Odyssey Middle School and imagines all sorts of terrible things that could happen there - from encounters with gangsters to a journey back to the Old West. Hear from Stuart Allen who plays Buddy in his Odyssey debut. Plus, get a sneak peek of a scene from the adventure. Sage and Erin Bolte argued and fought as siblings Robyn and Melanie Jacobs on Adventures in Odyssey, modeling their performances after their real-life squabbles. As daughters of then-executive producer Chuck Bolte, they saw the inside story of Odyssey and of Chuck himself. Landon Arnold played Scrubb Moseley -- Rodney Rathbone’s cousin -- as well as the role of Cody Carper. And he is the son of now executive producer (then sound designer) Dave Arnold. So Landon grew up in the midst of Odyssey production. Hear about those days years ago, plus a few secrets about Dave Arnold himself. Plus, hear a preview of "A Very Bassett Wedding, Part 2." Aria Curzon first appeared as the title character of Clara in episode "Clara." And then she returned as Mandy Straussberg for nearly ten years. Plus she starred in three Odyssey live shows. Hear about her time on the show and what she’s been up lately! Plus, hear a preview of "The Boat People, Part 2." Nathan has voiced many characters, from John Mark in "The Imagination Station" to Inspector Cordova in "The Cross of Cortes" to a Mandy and David Straussberg’s dad. But he’s most well-known as bad-guy turned good-guy Richard Maxwell. Nathan chats with us about the craft of voice acting. Plus, hear a preview of Album 61: "Without a Hitch," now available in the Club. Justin Felbinger took over the role of Matthew from Gunnar Sizemore and Zach Callison, a talented legacy of Matthews. Justin's bringing his own brand of fun and heart to the character. In this podcast, Justin tells us about his background in acting, being a part of the Parker family, and gives a preview of upcoming episodes "Parker for President," "The Key Suspect," and "The Grass is Always Greener." Bob and Jesse hand out awards for two Adventures in Odyssey albums! Hear the winners for "Best Actor," "Best Actress," "Lesson Learned-est Moment," "Best Host," and "Best Overall Episode." Be sure to listen for several surprise (and surprised!) guests. Thank you to everyone who voted! Listeners meet Renee D. Carter in this month's OAC episode. Renee is an intern at Whit's End and she'll be appearing in several future episodes. Hear from Amy Pemberton, the voice actor behind Renee, on today's podcast. Plus, hear a preview of "Things Not Seen." In a new feature, Bob and Jesse interview Natalie Babbitt, the voice of Jenny Roberts. Jenny starred in episodes like "Pen Pal," "The Perfect Witness, Parts 1-3," and "Count it All Joy." Hear her memories of her time on Odyssey and what she's up to now. May 11, 2016: Get answers to your burning questions: "Why wasn't Eugene in album 60?" "Is Janna moving to Odyssey?" "What is the name of album 61?" And more. Plus, Avery Awards nominations! The writers and producers answer your questions like: "Why wasn’t Eugene in album 60?" "Where is Wooton's house?" "Is Janna moving to Odyssey?" "What's the name of Album 61 (and 62!)?" "Will any of Wooton's relatives return?" "What is Old Tricks about?" "Will Jason have a big role in upcoming shows?" "How was Bernard Walton in Pinocchio?" "Did Jack Allen have any children?" and more. Plus, Bob and Jesse reveal the nominations for the Avery Awards for "Taking the Plunge" and "Head Over Heels." Vote today! Kurt Bruner and Al Janssen both worked with Adventures in Odyssey in the late 1990s and early 2000s. Now, they work with Open Doors, this month's featured ministry in the Odyssey Adventure Club. Kurt and Al told us about working at Whit's End, whether "Sunset Bowlawater" fits in Adventures in Odyssey, and a soon-to-be-fan-favorite bailiff character. Plus, they tell us what Open Doors is doing around the world and how the Club episode "When One Door Closes" fits into that mission. DJ Harner has been acting on our show from before it was called Adventures in Odyssey. She appeared in the very first Focus drama called "Spare Tire." She was later cast as Whit's daughter Jana and recently returned as the same character in "Between the Lines." Hear how she was cast for Odyssey, her experiences with Hal Smith, and how she actually held the same job as Jana in real life. Wooton's twin brother Wellington is his opposite in almost every way. Hear from the actor who brings Wellington to life -- Dale Inghram. Dale has lent his screams to video games, his voice to commercials, and his hobbit feet to Samwise Gamgee. Learn about his acting jobs and the creation and the reappearance of Wellington Bassett. Wooton and Penny recently travelled to Pittsburgh to meet Penny's parents. The actors behind Frank and Eleanor Wise (Victor Brandt and Carol Mansell) tell us about that first meeting, creating the characters, and working with Jess and Kimmy. How did Jared Depasquale start creating music? How does he create themes that underscore Adventures in Odyssey episodes (and Radio Theatre dramas)? And what exactly are an "oud," a "duduk," and a "bouzouki"? The answers to these questions and more on this podcast! In January 1956, five American missionaries travelled to a remote part of South America to contact an isolated tribe then known as the Aucas. The story of their deaths and what happened between the families of the fallen men and the tribe who killed them is told in a new Imagination Station book: "In Fear of the Spear." Steve Saint (son of one of the missionaries) and Marianne Hering (author of the new book) tell how the new book came together. On the latest edition of "Candid Conversations," two new hosts step into Connie's chair. They take calls from listeners, interview Kathy Buchanan (author of the Candid Conversations book series) and Liz Duckworth (the editor of the series), and hear a preview of "Walk This Way." From creating a wacky movie named The Green Slime in Japan, to playing Robyn and Melanie's mother on Adventures in Odyssey, to voicing car parts in North Carolina, Ann Ault tells us about her journey of faith. Months ago, Joleen Steel nominated her father Eldon Babcock for the John Avery Whittaker Award. In November, he was chosen as the grand prize winner. Hear from Joleen how her father is like Whit and hear stories (and voices!) from Eldon himself. In the very first Odyssey live show, the gang from Whit's End hosts a wacky New Year's eve celebration. Hear how the show came together from writer/director Phil Lollar and executive producer Dave Arnold. Plus, hear never-before-heard scenes and songs from the performance. April Hong stars as Min in this month's OAC adventure. She shares her experiences acting, talks about travelling with her father (actor James Hong), and tells what makes Odyssey unique. Melissa Disney made her Odyssey debut as Monica Stone in "Plan B" in the midst of the exciting Novacom saga. Since then, she's voiced a love interest for our favorite mailman in "Wooing Wooton," a young Jenny Whittaker in "Great Expectations," and now, a mom in Singapore in the upcoming adventure "A Daughter's Love." Hear a preview of this episode and more. November 11, 2015: Album 59 answers from Paul and Dave: Are Wooton and Penny really getting married? Will they meet Penny's parents? Plus, hear a scene from Album 60: Head Over Heels! Dave and Paul answer your questions: Are Penny and Wooton really getting married? When will the wedding take place? Will they meet Penny's parents? Will Wooton and Penny have kids once they’re married? Will there be any action episodes in the future or a new villain? Will you find a replacement for Jay or will you have to bring back Rodney? Will you ever have another contest like Get in the Show or open casting calls? Plus, hear the first scene from "Words from the Wise," the first episode in the upcoming Album 60: "Head Over Heels." Wooton was taken with Penny from the moment they met, but Penny took awhile to fall for everyone's favorite mailman. Since then, the couple has been through many twists and turns before finally arriving at a point of decision in "Taking the Plunge." Hear what went on behind the scenes as the actors relive their relationship. Plus, hear Bob Smithouser and Dave Arnold in an unusual scene from "Take it on Trust," this month's OAC adventure. October 14, 2015: How was the wacky adventure "Walter's Flying Bus" created? Painting monkeys, glowing eyes, buses flying with kite power -- all are elements of this month's OAC adventure: "Walter's Flying Bus." How did these elements come together? Writer Bob Hoose and sound designer Christopher Diehl tell us. Alex Polinsky first appeared as Ken Blaylock in "Target of the Week," but now appears as Dion - second-in-command in Vance's gang/club. Alex tells us about working on Odyssey, meeting Jim Henson, and a job creating toys. Plus, hear previews of Taking the Plunge, episode 2: "Playing the Predictable" and next month's OAC episode: "Walter's Flying Bus." September 16, 2015: How did Vance King pass from Jason to Jason to Jason? Find out what that means in this podcast! Plus, hear a preview of "Taking the Plunge." Jason Earles voices Vance King as well as a famous character on the Disney Channel. Find out how the role of Vance got passed around and where his villainy comes from. Plus, get a few hints of his role in "Taking the Plunge." August 19, 2015: Everything you need to know about the creation of "Pinocchio: The Tale of a Foolish Puppet"
Writer/director Dave Arnold goes back to the beginning to tell us how the Adventures in Odyssey adaptation of Pinocchio came to be. It's a story with an Italian author from the 1800s, a bunch of "old time" Odyssey actors, and the man who played Pinocchio in the 1940 Disney movie. Plus, hear about the lessons hidden throughout the story, from wisdom to salvation. August 5, 2015: VIDEO PODCAST: Celebrate the release of "Album 59: Taking the Plunge" with behind-the-scenes footage, interviews, and more! In celebration of the release of "Taking the Plunge," peek into the studio for recording, hear from writer/director Paul McCusker, and see a fan re-created scene from the album. Simon Jones is a judge in Odyssey, but he's also the dad of Emily and Barrett. Joel McCrary, the voice behind Judge Jones tells us more about creating his character. Plus, a preview of Album 59: Taking the Plunge. John Campbell has composed the music for more than 500 Adventures in Odyssey episodes. Now some of his recent music is available as a soundtrack in the Odyssey Adventure Club. John shares the story behind creating some of his favorite musical moments. Andre Stojka (voice of Whit) and Townsend Coleman (voice of Jason) talk about the recording an adventure set in the region of Papua in the Odyssey Adventure Club episode "To the Ends of the Earth." In the first episode of Album 59: Taking the Plunge, Penny considers Wooton's proposal by asking what it means to be married while he deals with a setback in re-building his house. Bill Pagaran, founder of Carry the Cure, tells of his Alaskan adventures that inspired Wooton’s trip to Alaska in the Odyssey Adventure Club. Sound designers Nathan Jones, Jonathan Crowe, and Christopher Diehl talk about creating the epic sound effects of "The Cure." Writer Marshal Younger, director/producer Phil Lollar, and sound designer Rob Jorgensen talk about the creation of "I Slap Floor," one of Adventures in Odyssey's funniest adventures. Keith Silverstein started his time on Adventures in Odyssey as Santo in "Shining Armor" before appearing as FBI agent Peter Bourland in the Novacom Saga. Keith is back in "The Cure" as a champion dogsled racer. Keith tells us how he created iconic lines like "Robert Mitchell is dead," the way he created the sound of crossing a glacier, and gives a preview of "The Cure, Part 3." Plus, hear the opening for the Spanish version of Adventures in Odyssey. Tony Amendolda, voice of Chief Tom[/caption]Actor Tony Amendola shares about his roles The Mask of Zorro and others and his new role of Chief Tom on Adventures in Odyssey. Plus, hear a preview of "The Cure, Part 2." This round of the Avery Awards takes place at Odi-con, an Odyssey fan convention. See the winners for "Best Actor," "Best Actress," "Best Scene," "Best Sound Moment," and "Best Overall Storyline." Matt Hurwitz got his start as a fill-in voice for Rodney Rathbone. Since then, he's played a doctor, a newspaper editor, a police officer, a judge, and now - an Alaskan pilot. Plus, hear preview of the "Candid Conversations with Connie" audiobook. Zach Callison voiced Matthew Parker for a number of years, but handed the part to another actor when his voice changed. Zach checks in to tell us what's happened since then, his favorite memories of the show, and his new role on Odyssey. January 7, 2015: Bob Vernon and John Fornof relive the creation of "The Last Chance Detectives"
With a B-17 bomber as their clubhouse, four friends use their detective skills to solve strange cases in the badlands of Arizona. Three video stories and three audio stories complete "The Last Chance Detectives" series and they are available now on the Odyssey Adventure Club. Hear from writer/directors Bob Vernon and John Fornof about the creation of the stories. December 24, 2014: FREE EPISODE: "A Lamb's Tale"
Writer/director Paul McCusker gives us some hints and teases about what's coming up in the next album of Adventures in Odyssey (Album 59: Taking the Plunge). Plus, hear a preview of this month's OAC episode: "All By Myself." The Odyssey team first heard Barbara Niles during an open casting call in 2008. Her audition was memorable because she brought baked goods to the session and created a whole town of characters. Years later, she appeared in the show as a drama teacher and was eventually revealed as an antagonist to Mr. Whittaker. Hear her story in today's podcast, plus a preview of "The Ties that Bind, Part 13." First, the sound designers share about the unique challenges of "The Ties that Bind" that included a crowd of zombies, a train wreck, and people getting beat up. Then, a new contest where you can win Album 58 and an Odyssey T-shirt. And finally, the actors answer the question, "What does family mean to you?" First, Marianne Hering tells us about the end of the Revolutionary War and the end of the Imagination Station trilogy in "Surprise at Yorktown." Then, Dan Hagen tells about his life in New York on Broadway, his experience at doing many different versions of a scene in video games, and of course his work as many loved characters on Adventures in Odyssey. And finally, we hear a preview of this weekend's episode of "The Ties that Bind." October 1, 2014: Buck is back and so is Robby Bruce (the actor who plays him). Hear an interview with Robby and a scene from this weekend's show. Actor Robby Bruce has listened to Adventures in Odyssey since he was a baby and now he plays fan-favorite Buck Oliver. Robby talks with us about the development of his character and how the character has changed since "The Green Ring Conspiracy." Plus, hear a full scene from "The Ties that Bind, Part 5." Actor Chad Doreck voices Hadley Bassett, Wooton's cousin in "The Ties that Bind." Chad is an actor, a singer, and the voice of several popular characters for popular Disney video games. Chad tells us about creating Hadley and gives a preview of upcoming adventures. August 20, 2014: "Why does album 58 have 14 episodes?" "Why is there a new voice for Matthew Parker?" "Will Jeff Lewis ever return?" Dave and Paul answer. August 6, 2014: VIDEO PODCAST: Odyssey artist Gary Locke shares tips on how to draw. July 23, 2014: Bob Smithouser and Brock Eastman share their stories and talk about a transition in the Odyssey Adventure Club. Phil Proctor has voiced Mr. Coreli in “The Other Side of the Glass,” Principal Spence in the “The Jubilee Singers,” and even Eugene’s father Leonard Meltsner. Phil shares secrets of voice acting and the surprising connection between Sherlock Holmes and Dr. Watson and Detective Polehaus. June 11, 2014: The voice of Red Hollard jumps on the podcast like a duck on a Junebug! Steve Eastin shares stories from his acting life, from his birth in a fatal car accident...to his movie career...to voicing a handyman named Red Hollard. Cullen McCarthy joins the Odyssey cast as Brian in several upcoming Adventures in Odyssey episodes. Brian tells what it's like to audition and to be part of a "loop group." May 14, 2014: Coordinator Angie Ralston talks about Odyssey recording sessions, Social Shout-outs, and working with the Odyssey team. Angie Ralston has worked as a coordinator for the Adventures in Odyssey team for just over a year now. She tells about setting up an Adventures in Odyssey session, meeting the actors, and creating the Social Shout-out. Writer Kathy Buchanan and consultant Leanna Summers share how true stories from Compassion International inspired "Mission: Unaccomplished." Plus, hear a preview of that episode and Wooton's Whirled History. April 16, 2014: Hear "You Are What You Eat" - a never-before-heard deleted scene from "The Bible Network"
Bob and Jesse introduce a fully-produced deleted scene from "The Bible Network" and interview the people behind the scenes: writer Marshal Younger and sound designer Christopher Diehl. A special thanks to KMAP Studios for production of this scene. Hear a preview of this month's OAC episode and get a glimpse into the world of comic books as Chad Beninati and Bob Hoose share the story behind the scenes. Mitzi McCall voiced two similar characters - Mrs. Sutton and Mrs. Kramer. She shares the origin of these characters, plus how she overlaps with several moments in show-biz history. "Clubhouse Magazine" transformed to "Adventures in Odyssey Clubhouse," so Brock takes the opportunity to meet the talented team that creates the magazine every month. The Adventures in Odyssey team, from actors to directors to sound designers, remember our favorite curmudgeon Dave Madden. Jesse and A.C.T.S. winners Marissa and Wesley travel to Costa Rica for their grand prize mission adventure trip. Plus, see a preview of the true story behind the first Odyssey Adventure Club episode and see what it was like recording with the actors. In Part 2 of this episode from the recent "A Call to Something More," Connie's old friend continues the incredible story of a mission trip to a remote village. It's a story of medical mystery, daring plane flights, and even...love. Plus, hear an interview with executive producer Dave Arnold about the upcoming Odyssey Adventure Club. In this episode from the recent "A Call to Something More," an old friend of Connie’s tells her the incredible story of a mission trip to a remote village. It's a story of medical mystery, daring plane flights, and even...love. Plus, hear interviews with producer Brock Eastman and Focus Vice President Jim Mhoon. Lori Tritel (voice of Lilly Graham) talks about playing recent emotional scenes on Odyssey, and how to practice for acting. PLUS: Hear a scene from "The Launch," the first show for the Odyssey Adventure Club! Executive Producer Dave Arnold and Creative Director Paul McCusker talk about Album 57, June Kendall's passing, the Odyssey Adventure Club, and upcoming albums. Plus: Avery Award nominations! October 16, 2013: Voice actor Gary Reed talks about Jeff Lewis's re-appearance, plus a preview of "The Pilot"
Jeff Lewis recently re-appeared on Adventures in Odyssey after a 23 year absence. Gary Reed continues to voice Jeff and he shares his background and thoughts on the show. Plus, hear the first scene of "The Pilot." October 2, 2013: NEW VIDEO PODCAST: Watch the A.C.T.S. finale webcast! Watch the live webcast from September 30, featuring actor Townsend Coleman (voice of Jason), Shona Kennedy (winner of Get in the Show), and the announcement of the A.C.T.S. grand prize winners! September 18, 2013: College Writer's Scholarship Contest entrant Katie Wynn shares about writing, plus a preview of "Big Trouble Under the Big Top"
Katie Wynn grew up listening to Odyssey and entered a script in a writing contest. That script turned into this weekend's episode: "Big Trouble Under the Big Top." Hear an interview with Katie (and co-writer Bob Hoose) and a preview of her show. September 4, 2013: NEW VIDEO PODCAST: Watch all 24 finalists for the A.C.T.S. contest! Chosen from hundreds of entries, watch the 24 finalists for A.C.T.S. and then vote on your favorites. One boy and one girl that you choose with go on a Mission Adventure Trip to Costa Rica. August 21, 2013: FREE EPISODE: "Wonderworld"
In this episode from "A Place of Wonder," Jimmy Barclay decides he's too old for Whit's End and the Imagination Station, but comes to a new discovery through an imaginative boy named Lawrence. Plus, hear an interview with writer/director Phil Lollar and voice actor Gabriel Encarnacion. Bob and Jesse interview young Michaela Dean, the voice of Camilla and then play exclusive clips of Album 57: A Call to Something More. The first episode airs this weekend on the radio and online! July 24, 2013: NEW VIDEO PODCAST: Enter the A.C.T.S. Contest Now! Adventure in Odyssey actors, producers, and interns talk about how they serve their family, their community, and their world. Don't forget to submit your 2-minute video by August 16! David Griffin talks about the difficulty of the Barclay family's move to Pokenberry Falls and the episodes where he returned: "Living in the Gray" and "The Triangled Web"
Wayne Thomas Batson talks pirates and islands, knights and castles, and even mythical beasts. He authored "Hunt for the Devil's Dragon," the latest Imagination Station book. See highlights of the recent A.C.T.S. live webcast, including interviews with Katie Leigh and Chris Anthony, a tip from Get in the Show winner Shona, the revelation of the grand prize destination, and a never-before-seen surprise! Alan Young became the voice of Jack in 1994. Since then, Jack has married Joanne Allen and become the owner of J and J Antiques. He recently appeared in "Home Again" in album 56. May 1, 2013: The A.C.T.S. contest launches. This your chance to win big! Bob and Jesse reveal A.C.T.S.! This summer, you’re invited to be part of something BIG! Adventures In Odyssey presents A.C.T.S.! – A Call To Serve. Join thousands of kids across the country making a commitment to serve your family, your community and even your world! Dave Arnold and Bob Luttrell share more stories of the creation of the sound of Odyssey, including how working on the show has an effect on their spiritual lives. The names Dave Arnold and Bob Luttrell appear on hundreds of episodes of Adventures in Odyssey. Hear the stories of how they started on the show and the secrets behind the sound effects. March 6, 2013: Author Nancy Sanders shares stories from "Challenge on the Hill of Fire"
Nancy Sanders authored several of the Imagination Station books. She shares stories about "Challenge on the Hill of Fire" and previews the upcoming "Danger on a Silent Night." Bob and Jesse present the awards for Album 56: The Grand Design. The awards include: "Best Actress," "Best Sound," "Best Actor," "Best Script," "Best Scene," and "Best Overall Episode"
Jan. 9, 2013: The Grand Design Avery Awards Voting, plus Ask the Producers! Dave Arnold and Paul McCusker answer your questions looking back at album 56 ("The Grand Design") and looking ahead to album 57. Plus, Bob and Jesse announce the nominations for the Avery Awards. Dec. 26, 2012: FREE EPISODE: Family Portraits: "You're Not Gonna Believe This…"
Hear a free episode of the original Family Portraits drama series. This series launched Adventures in Odyssey 25 years ago and it's now available for digital download. Actors Katie Leigh, Andre Stojka, and Zach Callison answer your questions live on stage. Nov. 14, 2012: NEW VIDEO PODCAST: Watch the Get in the Show finale event, including the last auditions with the actors and the announcement of the winner! The Clubhouse Magazine issue for November 2012 features an interview with Gatlin Green and Andy Pessoa, plus lots of Adventures in Odyssey birthday stories! Oct. 17, 2012: Hear from all three actors who play Whit in "Great Expectations"
Oct. 3, 2012: Watch the Get in the Show semi-finalist videos and learn how we selected the semi-finalists! The Odyssey team tells how they judged the thousands of entries to Get in the Show, Bob and Jesse watch highlights of the finalists, and Dr. Brock Lee explains the grand finale. Sept. 19, 2012: Explore the new Captain Absolutely comics in Clubhouse Magazine! Bob and Jesse chat with Christopher Maselli (the author) and Dennis Edwards (the illustrator), the creators of the new Captain Absolutely comics in Clubhouse! Sept. 05, 2012: FREE EPISODE: "Happy Hunting"
In this episode from album 56, Penny Wise embarks on a frantic search to find happiness, but in the process she makes everyone around her miserable. Hear the first clip of "The Perfect Church," an episode in album 56: The Grand Design. All 12 episodes are now available for download. Plus, learn about "The Labyrinth" from actor Simon Kassianides! July 25, 2012: Dave Arnold talks about the true history behind "Sergeant York"
Writer/director Dave Arnold talks about the sources and inspiration for Sergeant York, plus an announcement about "Get in the Show!" July 11, 2012: NEW VIDEO PODCAST: Footage from the Dallas live show plus a Get in the Show update! Join Bob and Jesse as they reminisce about the Birthday Bash in Dallas and present an upbeat Get In The Show feature. Hot on the heels of the historic 25th Anniversary Odyssey Live Show in Dallas, Jesse decides to broadcast a LIVE Avery Awards broadcast for Album 55. But all is not well when a protest blocks their way. In this pun-filled episode, Paul McCusker and Dave Arnold answer your questions as they rehash album 55 and prehash album 56. May 30, 2012: Writer Kathy Buchanan answers, "Why did Mitch come back? Cats aren't extinct!" Kathy Buchanan tells us all about Mitch's recent return and whether there's any hope for another return. Plus, hear about what's coming up next season. May 16, 2012: Steve Burns and Katie Leigh (voices of Connie and Mitch) chat about Mitch's return, plus more acting tips! May 2, 2012: The sound designers raise the curtain on "Sergeant York"
Sound designers Christopher Diehl and Nathan Jones reveal their secrets in creating the unique sound effects in the "Sergeant York" episodes, plus a preview of "Child's Play." April 18, 2012: Jon Curry and Renee Dorian (voices of Sergeant York and Gracie), acting tips, and a preview! Jon Curry (voice of Sergeant York) and Renee Dorian (voice of Gracie) share their stories. Katie Leigh and Gatlin Green share acting tips. And hear a preview of "Sergeant York, Part 3"
Phil Lollar and Milby Barron (the voices of Dale and Ann) talk about their characters' return to the show. Plus, hear a preview of the upcoming "Sergeant York." March 21, 2012: Hear from Georgia Dolenz, the voice of Sue in "The Labyrinth"
Georgia Dolenz, first heard in "The Labyrinth," tells us her story of voice acting and her famous dad. Plus, hear a preview of "To Mend or Repair." March 7, 2012: Bob and Jesse hand out the "Clanging Cymbals" Avery Awards from an unexpected location. Bob and Jesse take a break from recording the podcast to relax on vacation...until they get an urgent call from Odyssey coordinator Evan Reedall. Hear the world premiere of the "Get in the Show" theme song and watch a lyrics video. Plus, get more details on the Adventures in Odyssey Birthday Bash and the Get in the Show contest! Watch a new video podcast about the upcoming live show on June 16, 2012 in Dallas, Texas. Tickets go on sale Monday, February 13! The Great Facebook Challenge: Like Us on Facebook, Get "The Labyrinth" download free! We need more "likes" on our Adventures in Odyssey Facebook page! If we get enough by February 1, we’ll give away "The Labyrinth" as a free download to all listeners. "The Labyrinth" features Jason Whittaker chasing Mr. Grote, the bad guy from "The Green Ring Conspiracy!" Dec. 14, 2011: Andy Pessoa (voice of Barrett), fan reviews, and a preview of "Childish Things!" Bob Hoose has been working on Adventures in Odyssey since 1989. He's acted, written shows, directed sessions, and served as producer. Here, he tells us the stories of "Emily the Genius" and "Unbecoming Jay"
Nov. 16, 2011: Kelly Stables (voice of Olivia) talks about Adventures in Odyssey, Hoodwinked, and more! Bob and Jesse chat with Kelly Stables, the voice of Olivia Parker in album 54 and beyond. Plus, they hear a sneak peek of this weekend's show "Never for Nothing." Gatlin Green tells the story about growing up on a tour bus with the music group Sierra, her brother Cooper acting on Adventures in Odyssey, and playing Barrett's friend Priscilla. Lucki Wheating moved to the United States when she was nine years old. We hear her story and how it eventually led her to play Grandma Lucia Ortega on Adventures in Odyssey. Plus, hear a preview of this weekend's show "Anger Mismanagement." Oct. 5, 2011: Kimmy Robertson, voice of Penny Wise, shares stories with us, plus a preview of "A Penny Saved." Kimmy Robertson talks about joining the cast of Adventures in Odyssey as Penny Wise in "The Green Ring Conspiracy" and her continuing adventures in "Clanging Cymbals." September 21, 2011: NEW VIDEO PODCAST: See a slideshow from 1989, plus a fan created Communicate rap from "Lights Out at Whit's End"
Bob and Jesse venture into the Odyssey Vault to unearth a slideshow created in 1989 about Adventures in Odyssey. They also watch a fan-created music video of the Communicate rap from "Lights Out at Whit's End." In this Odyssey classic, Jimmy Barclay goes on his most incredible adventure ever when meets a gentleman named Mr. Nagle on a World War II bomber. Watch a full Pop-upisode of "A Name, Not a Number," one of the episodes in the new compilation album: "The Blackgaard Chronicles." The Blackgaard Chronicles contains 30 episodes from Adventures in Odyssey's first big story arc. This collection also includes a half-hour video featuring an interview with Paul McCusker and Phil Lollar about the creation of Dr. Regis Blackgaard. August 10, 2011: FREE HALF EPISODE: "Wooton Knows Best," plus Album 54 release! Bob and Jesse announce the release of album 54 for digital download on August 15. They also release the first twelve minutes of the first show, "Wooton Knows Best," along with the trailer for "Clanging Cymbals...and the Meaning of God's Love." Brock and Bob are on their way to the Avery Awards ceremony for the "Green Ring Conspiracy" when Jesse arrives with bad news -- a plane has crashed into the awards venue. Bob and Jesse call the winners of each category in the Green Ring Art ConteSt. Plus, Imagination Station artist David Hohn reveals his tricks of the trade. June 29, 2011: Paul McCusker and Dave Arnold answer questions about returning characters, including Buck, Jason, Mr. Grote, and Detective Polehaus, plus a preview of album 54! Dave and Paul answer your questions, including "Will Buck ever come back?" "Where do the ideas come from?" "How long have you been growing a beard?!" Plus, hear the very first preview of Album 54: Clanging Cymbals and the Meaning of God's Love! When the Green Ring Art Conte$t entries go missing, Jesse recruits a team of savvy crime fighters to find them. Along the way, they discover a trail that leads to a familiar conclusion. Plus, see the crazy lengths that the sound designers go to get just the right sounds for Mr. Skint's truck in album 53. June 1, 2011: NEW VIDEO PODCAST: News Update: Go inside the studio with the actors and crew of "The Green Ring Conspiracy"
In breaking news, "The Green Ring Conspiracy" reached a dramatic conclusion with the release of Part 12 last weekend. Newscasters Bob and Jesse relay fan reaction to this news, reactions from the crew, and behind the scenes footage from the recording session. Also, they reveal that an episode of the TV series 19 Kids and Counting will feature Adventures in Odyssey and Focus on the Family on the June 19 edition. The art contest ends this Saturday, May 28. Be sure to send your entry in today! David Selby (voice of Mr. Skint) and Robby Bruce (voice of Buck Oliver) talk The Green Ring Conspiracy. Plus, hear a preview of the final episodes! Fan favorite Jason Whittaker has returned to Odyssey, so actor Townsend Coleman gave us the background on Jason Whittaker. Plus, hear a preview of the next episode! Jonathan tells the amazing story of his bike wreck, hospital stay, halo fitting and eventual recovery. Plus, hear calls from the comment line and a preview of the next episode of the Green Ring. March 9, 2011: NEW VIDEO PODCAST: Join the album 53 release party as we see new characters and watch an interview with Zach Callison! Bob and Jesse get ready for the release party of album 53: The Green Ring Conspiracy. Along the way, they meet some new characters, interview Zach Callison (voice of Matthew Parker), and discover what really goes on in California. Feb. 23, 2011: Adventures in Odyssey goes to space and travels 5.7 million miles! Bob and Jesse interview astronaut Terry Virts who took Adventures in Odyssey into space with him last year. Feb. 9, 2011: Hear the results of the Averies for Album 52: Cause and Effect! Feb. 1, 2011: Watch a special announcement about album 53. Watch a special announcement about album 53. Jan. 26, 2011: Paul McCusker and Dave Arnold answer questions about The Green Ring Conspiracy, the Stilletto, titles, and more. Plus, an audio preview of album 53. Dave and Paul answer your probing questions, such as "What is the title of album 54?" "Who is the Stilletto?" "What are the appropriate ages for album 53?" "When will Katrina return?" and "Why don't the episodes in album 53 have titles?" Plus, hear another exciting preview! In this packed-to-the-gills podcast, first hear from sound designer Todd Busteed, then hear all of the nominations for this season's Avery Awards. Finally, hear a scene from the first episode of "The Green Ring Conspiracy." Jared and Dwayne take their favorite computer game Gloobers to the next level when they get a chance to play the game "for real" in the Room of Consequence. Dec. 15, 2010: Actor Whit Hertford takes us into the mind of Jay Smouse, plus hear a preview of the season finale: "Grandma's Christmas Visit"
Whit Hertford talks about Jay, the creation of a bully, and singing in "A Thankstaking Story." Plus, we hear a preview of "Grandma's Christmas Visit" and nominations for the Avery Awards. Dec. 1, 2010: Actress Kari Wahlgren starred in "Camp What-a-Nut" and now returns for "An Agreeable Nanny"
Kari Wahlgren tells the story of her surprise appearance in "Camp What-a-Nut" and her long journey to return after many years late in this weekend's show "An Agreeable Nanny." Nov. 17, 2010: Adam Wylie (voice of Ryan Cummings) talks about Odyssey, voice acting, and being the mayor of Kidsboro, plus hear a preview of "Square One." Adam Wylie tells about performing in Adventures in Odyssey and Last Chance Detectives. He also answers what it's like working in Kidsboro, basketball, and the challenges of voice acting. Bob and Jesse celebrate Opposite Day, by doing the opposite of what they would normally do. They don't preview "Opposite Day" And they can't chat with writer Kathy Buchanan...or can they? Oct. 20, 2010: Set sail with Vikings in the Imagination Station books, plus hear a preview of "Stage Fright"
Author Marianne Hering talks about the Imagination Station books and shares stories from editing the Official Guide. Hear Bob and Jesse share previews of this weekend's show "Stage Fright" and a special online feature called a Clickbook. Oct. 6, 2010: Radio Theatre is back on the air! Go behind the scenes with the creators, plus previews of the Imagination Station book series, Album 52, and more! Jesse steps out of a wardrobe with a story about Focus on the Family Radio Theatre being back on the air, a new series of books on the Imagination Station, and a preview of album 52! Come along! Jesse interviews Sydney Shiotani, voice of Camilla Parker, the youngest guest ever on the podcast. Also, hear an exclusive clip of "The Mystery of Clock Tower" and a trivia tidbit about Album 52: Cause and Effect. Bob and Jesse show more videos from the Act Like Odyssey contest, including clips from "Hidden in My Heart," "A Class Reenactment," "Snow Day," and more! The Odyssey cast and crew reflect on the life of Paul Herlinger, voice of Whit. Guests include Katie Leigh, Will Ryan, Chris Anthony, Paul McCusker, Dave Arnold, Jonathan Crowe, Marshal Younger, John Fornof, Nathan Hoobler, and Mark Herlinger. July 28, 2010: Celebrate Podcast 100 with Bob, Jesse, Brock, and clips of your favorite episodes! Bob and Jesse celebrate one hundred episodes over almost four years of podcasting. Hope Levy (voice of Olivia) talks about her singing, acting younger than she is, and her favorite Odyssey episode. June 30, 2010: Hear from Dave and Paul with more questions, including Where is Katrina? and What is the title of album 53? Dave and Paul answer more questions from fans, reveal the title of album 53, discuss Katrina's future role, and talk about their favorite episodes in Take it from the Top. June 16, 2010: Hear the dramatic results of the first-ever Avery Awards! Bob hosts the Avery Awards, including awards for Best Sound Design, Best Script, Best Actor, Best Actress, and Best Episode! June 2, 2010: Hear the finalists for the Avery Awards , plus the producers answer your questions about Whit, old characters, changes, and more. Hear the finalists for Best Scene, Best Line of Dialog and others in our end of season voting. Plus, Dave Arnold and Paul McCusker answer probing questions about the new voice of Mr. Whittaker and the many changes to Adventures in Odyssey. Mandisa talks about her experience in the Jubilee Singers at Fisk University and how they influenced her life and career. Plus: Submit your nominations for the Whitty awards! "Oh My Lord" used by permission from EMI CMG Publishing, Joy Williams, Spudnut Music, and WB Music Corp.
Bob and Jesse interview Zach Callison on his role as Matthew Parker and hear about his work on "Are You Smarter than a 5th Grader?" Plus: hear the title of album 52! Apr. 8, 2010: Vote on the Act Like Odyssey finalists! Watch all of the ten finalist videos and vote on your favorite! Christopher Maselli talks about crafting the Emily and Matthew mystery stories in Clubhouse Magazine. Bob and Jesse hear more fan calls in the "Your Chance to be on Adventures in Odyssey Contest." Fans answer the question, "How does Connie inspire me?" Mar. 10, 2010:Andre Stojka talks about joining the Odyssey family and shares his story. Plus, hear a preview of "The Inspiration Station, Part 2"
Andre Stojka talks about his audition for Adventures in Odyssey and Katie Leigh talks about the process of finding a new Mr. Whittaker. Also, hear an exclusive preview of the first scene of "The Inspiration Station, Part 2." Feb. 24, 2010:Hear "Welcome to Whit's End" an all-new mini-episode tour of Odyssey, plus a sneak peek at the first scene of "The Inspiration Station"
Join host Chris Anthony in "Welcome to Whit's End," a new 11 minute tour of Odyssey. Plus, be the first to hear the opening scene of "The Inspiration Station," the first episode in album 51. Feb. 10, 2010: John Campbell shares about music for Odyssey, plus a new Odyssey theme song! John Campbell tells stories about composing the music for the show and shares a new theme song. Plus, vote for a new podcast theme! Jan. 27, 2010: "Bob" and "Jesse" show the new designs of the Odyssey characters, plus the new Passages covers! Join hosts Broc...er...Bob and Jesse to see the new drawings of the Odyssey characters, the new Passages covers, and much more. Jan. 13, 2010: Watch videos from Odyssey fans and enter the Act Like Odyssey contest! Bob and Jesse watch videos from Odyssey fans in the Little Theater, explain the new contest, and take the first look at the cover of album 51. Enjoy a free episode from "The Encore Collection," plus hear writer John Fornof and sound designer Rob Jorgensen discuss the production of this popular show. Dec. 16, 2009: Torry Martin speaks about Wooton's Random Ramblings, plus Emily and Matthew solve a mystery! Hear from Torry Martin, creator of Wooton Bassett about a new Wooton page in Clubhouse magazine, his grandma's influence on his writing and more. You sent in over 500 questions and the producers answered as many as they could! Paul McCusker and Dave Arnold answer your questions about the upcoming season including juicy tidbits about the Inspiration Station, the Parker family, Eugene and Katrina's baby plans, the future of Tom Riley, story hints, which characters will appear in the new season, and much more. Nov. 18, 2009: Bob and Jesse try to hide Adventures in Odyssey secrets from a prying Odyssey fan. Watch clips from the studio and learn more about the upcoming Adventures in Odyssey album 51: "Take It From the Top." Nov. 4, 2009: Bob and Jesse present the finalists in the Darien's Rise Art Contest in this special video edition. Check out the art contest finalists for ages 12 and under and 13-18, then vote for your favorite online! Pete Reneday, voice of dozens of Adventures in Odyssey characters, talks about recording Passages, his favorite characters, and his voice in DisneyWorld. Sep. 23, 2009: Jim Cummings, voice of King Lawrence in "Passages" and voice over legend talks about his background, unusual projects, and playing an insane person. Bob and Jesse interview Emmy-nominated actor Jim Cummings on his voice over career. Jim talks about Darkwing Duck, Bump in the Night, Winnie the Pooh, Tigger, and more. Jim was also involved with Odyssey back in the "Family Portraits" days. Hear the concluduing episode of the epic story "Passages: Fletcher's Rebellion," plus hear an interview with Rob Jorgensen, sound designer for the program, on behind the scenes in-jokes in the show, his love of microphones and more. Hear the first part of the epic story "Passages: Fletcher's Rebellion," plus hear an interview with Rob Jorgensen, sound designer for the program, on his first production. Learn the history of the voice of John Avery Whittaker, from Hal Smith to Paul Herlinger and beyond to the future. A fan tells a story inspired by the show, and the Snowflake Incident is explained at last! June 3, 2009: Marshal Younger shares stories from Kidsboro, plus a surprise guest! Marshal Younger talks about the Kidsboro book series and introduces a surprise guest who inspired the books. Enjoy a free episode from "On Earth As It Is In Heaven" (album 17), plus hear Bob Luttrell talk about bringing actors to the show and stepping behind the microphone himself. May. 06, 2009: Hear secrets from the Odyssey Vault, plus Chick-fil-a president Dan Cathy! What's going on in the background of scenes? Find out as Bob and Jesse visit the Odyssey vault. Plus, Dan Cathy, president of Chick-fil-a tells us how Adventures in Odyssey wound up in their kids' meals. Apr. 22, 2009: New VIDEO Podcast: A New 'Passages' Scene Comes to Life and Much More! In the third-ever 'Adventures in Odyssey' video podcast, Bob and Jesse take a tour of what's happening in the Odyssey Team's offices. Sound designers Jonathan and Chris share clips of what they're working on, one of the first scenes in 'Passages: Darien's Rise' (coming this fall)! Among other surprises, you'll see a new clip from 'Adventures in Odyssey Live!' Finally, Paul McCusker reveals even more about the next Odyssey episodes coming in 2010 and executive producer Dave Arnold gives a quick teaser of 'Radio Theatre: The Screwtape Letters' releasing in October 2009. Apr. 8, 2009: Learn the Wild Ideas that Adventures in Odyssey Didn't Use in the 'Novacom Saga'!"! Bob and Jesse are back with more "Random Secrets from the Novacom Saga that You Never Knew Existed and Can't Possibly Live Without"! Mar. 25, 2009: Journey into the Adventures in Odyssey Writers' Room! Presenting all sorts of random secrets from Adventures in Odyssey: Novacom Saga! Writers Kathy Buchanan, John Fornof, Paul McCusker and Marshal Younger share about mapping out the Novacom conspiracy, Jared's exit from Odyssey, and more with plenty of wacky rabbit trails along the way! To get in on the act, sound designers Rob Jorgensen and Bob Luttrell reveal a few embarrassing incidents that got them the perfect sounds to create dramatic scenes. Mar. 11, 2009: Will there be any more 'Passages' audio dramas? When will new episodes premiere? The producers answer. You've got questions, they've got answers! During this Q and A with executive producer Dave Arnold and writer/director Paul McCusker, find out when new 'Passages' audio dramas will be releasing, whether any new adventures with the Washington family are in the works, what the live show DVD will look like, and more replies to what you wonder about 'Adventures in Odyssey'. Feb. 25, 2009: More Fun with Ben and Aubrey Shepard; Plus: Jesse's Rap! Two stars from "Adventures in Odyssey," Jerry Houser and Danielle Judovits, continue their conversation together, with insights into their other acting roles, what it's like inside the recording studio, what inspires them, and much more. Plus, don't miss the long-awaited "Library Rap" from podcast host Jesse! Feb. 11, 2009: Interview with actors Jerry Houser ("Ben Shepard") and Danielle Judovits ("Aubrey")"
One of Adventures in Odyssey's favorite father/daughter pairs - Ben Shepard and his daughter Aubrey - talk together in this joint interview with actors Jerry Houser and Danielle Judovits. Learn why the episode "Always" is special to Jerry, what Danielle is doing now, other acting roles they've done, and more! Jan. 28, 2009: FREE Adventures in Odyssey episode: "Called On in Class"
First up, enjoy the full-length episode "Called on in Class"... when Trent DeWhite has to present in front of his whole class, the mayhem he imagines is earth-shattering! Then, writer/director Bob Hoose joins us to discuss how Trent got his name, his experiences working with Adventures in Odyssey actors, and lots more. Jan. 14, 2009: Steve Burns, the voice of "Rodney" and "Mitch" on Adventures in Odyssey, tells all! After over 18 years on Adventures in Odyssey, the actor who's played Robert "Mitch" Mitchell and Rodney Rathbone shares his favorite episode, which character is more like him, why his kids love "Odyssey", and more! Dec. 30, 2008: Top 10 Musical Countdown Extravaganza! Believe it or not, Adventures in Odyssey has featured many songs over the years. Bob and Jesse countdown the Top 10 songs ever featured on the show, including songs from the musical album "Eugene Sings" plus a few unreleased surprises. Happy New Year! Dec. 16, 2008: Behind the Scenes of Adventures in Odyssey's Parody of "It's A Wonderful Life"! Revisit the spot-on spoof "It's A Pokenberry Christmas!" with Chuck Bolte (voice of George Barclay) and sound designer Mark Drury, who share never-before-heard secrets of this 2-part adventure. Dec. 3, 2008: FREE Adventures in Odyssey episode: "You Go to School Where?" Not released since first airing in 1989, "You Go to School Where?" features Robyn Jacobs switching places for a day with her home-schooled friend Esther - with hilarious results! Plus, get details on this year's Adventures in Odyssey iPod Contest. Nov. 19, 2008: NEW Video Podcast: See Whit Dance, Watch Clips from the Live Show, and lots more! Get ready for exciting surprises! In a video clip with actor Paul Herlinger (voice of Whit), see if Whit can dance. Enjoy the stirring and silly stories of families who attended the live show. Watch a live-action Adventures in Odyssey video demo, still in-production in India. And watch as Wooton, Connie and others perform a scene from the live show! Nov. 05, 2008: Questions and Answers with "Odyssey" Producers: When Will the Live Show Release? Are New Characters Coming? Questions like what happened at the end of Album #50: The Best Small Town, why Jack and Lucy's wedding probably won't be heard on the show, and new details about the next broadcast season of "Adventures in Odyssey"(coming Fall 2009). Oct. 22, 2008: NEW Interview with the Voice of Joanne Allen (actress Janet Waldo)! After over a decade on Adventures in Odyssey, actress Janet Waldo talks about her acting roles in "I Love Lucy," "Battle of the Planets" and other shows, plus learn why she loves playing Jack Allen's wife Joanne! Oct. 8, 2008: FREE Adventures in Odyssey episode - "BTV: Obedience"
The Biblical story of Elisha comes alive in B-TV: Obedience, a FREE half-hour drama from the new Adventures in Odyssey CD set Bible Eyewitness: Hall of Faith. Plus: do not miss an exclusive interview at the end with actor Dave Madden, voice of "Bernard." A bizarre electromagnetic anomaly catapaults the Official Podcast hosts into the Unofficial Podcast. Bob and Jesse review the Live show, talk to fans, and more. Chris and Sarah, hosts of the Unofficial Podcast, jump into the chairs of Bob and Jesse. They interview fans at the live show, plus hear another secret from the Official Guide from writer Paul McCusker. August 13, 2008: Hear Marshal Younger's story about "The Truth About Zachary"
Learn another behind the scenes "secret" from Adventures in Odyssey: The Official Guide! Sage Bolte (voice of Robyn Jacobs and daughter of Chuck Bolte) chats about her experiences on Adventures in Odyssey. Plus Jonathan Crowe talks about "The Case of the Missing Master Tapes." July 16, 2008: Behind the Scenes of Kidsboro, plus a never before heard “Goodbye Eugene” scene! Hear a scene from a deleted episode, plus more about Kidsboro. July 2, 2008: Get ready for the Adventures in Odyssey live show! Hear clips from past live shows and learn more about what's happening August 16. June 18, 2008: Hear deleted scenes from the Odyssey vault. Bob journies into the Odyssey vault searching for deleted scenes. Hear the Part 3 of "Kidsboro," then check out the books available in the Kidsboro series! Hear the Part 2 of "Kidsboro," then check out the books available in the Kidsboro series! Hear the Part 1 of "Kidsboro," then check out the books available in the Kidsboro series! May 14, 2008: Why don't you play "Lights Out at Whit's End"? What happened to Jason Whittaker? Is Bart played by a new actor? The producers answer. Producers Marshal Younger and Dave Arnold answer questions about the last season, Jason's disappearance, and what's coming up on Adventures in Odyssey. Apr. 30, 2008: Hear from the voices of Lucy and Jack! Hear from the voices of Lucy Cunningham-Schultz and Jack Davis, plus a preview of next week's climactic show! Hear from Earl Boen (voice of the Blackgaard brothers) about Odyssey, acting, and the creation of voices. Plus, learn how to win an iPod and enter an Odyssey Look-Alike Contest! Listen to Phil Proctor, voice of Leonard Meltsner, tell about the life of a voice actor. Also, hear a preview of next week's show! Hear an interview with Alan Young, voice of Jack Allen on Adventures in Odyssey and Scrooge McDuck on DuckTales. Also, hear a special preview of the upcoming season of Odyssey! Jan. 23, 2008: Producer Bob Vernon remembers the creation of the Odyssey videos. How did the creation of the Odyssey movies happen? What's your favorite video? Jan. 9, 2008: Host Chris Anthony tells more about life behind the mic. How did you get started with Odyssey? Tell us some stories about doing the voice of Barbie. Dec. 12, 2007: "Hi, This is Chris" -- Interview with actress Chris Anthony! Chris Anthony has been on every episode of 'Adventures in Odyssey'... now hear from her how Odyssey has changed over the years, what her family thinks when they hear her on the radio, and what her favorite episode is! Also, new letters from fans and word of the 'Adventures in Odyssey' DVD Game -- available by calling 1-800-A-FAMILY or by visiting WhitsEnd.org/Podcast. Nov. 14, 2007: Celebrating 20 Years of Adventures in Odyssey! Hear listener and actor comments on the show's 20th anniversary, plus hear an exclusive clip of the first broadcast of Odyssey USA. Oct. 31, 2007: Go undercover with Townsend Coleman, the voice of Jason Whittaker! 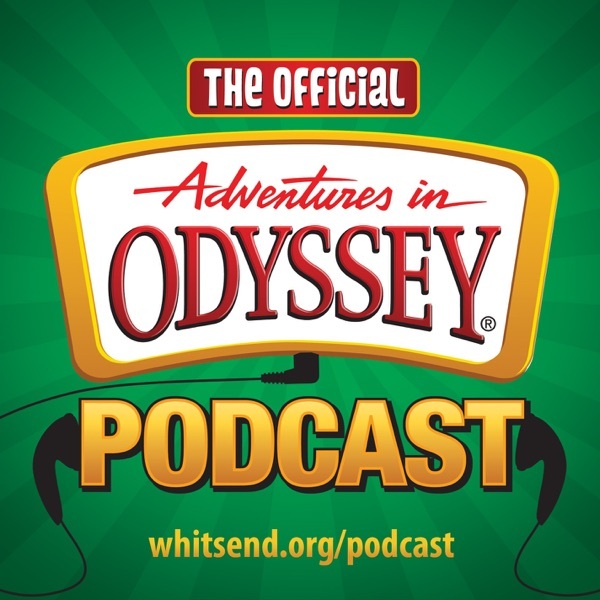 Actor Townsend Coleman (Jason Whittaker) tells how he first started with 'Adventures in Odyssey', why he loves the show and more... plus hear his very first audition! See Jason and other favorite characters up-close and personal in the 2008 Odyssey Calendar, available at WhitsEnd.org/Podcast or by calling 1-800-A-FAMILY. Have you ever played the DVD game 'Scene It'? Now Odyssey has its own version! 'Answer That! Adventures in Odyssey Edition' features over 1,000 questions that will quiz your knowledge of Biblical events and Odyssey characters. With audio and video clips that play on your TV, this Family DVD Trivia Game includes Room of Consequence cards, a game board, trivia cards, character play pieces, a Game DVD and more! Listen in as 3 Odyssey fans answer some of the game's Difficult Level trivia... and don't worry, there's an Easy Level where you can start. Call us at (800) A-FAMILY or visit WhitsEnd.org/Podcast for the DVD Game and other Christmas gift ideas. Oct. 3, 2007: Live from Missouri... the Artist behind 'Adventures in Odyssey'! Gary Locke, who's illustrated over 50 works of 'Adventures in Odyssey' art, tells us about how he got started, his inspiration... plus details on he and Jesse's new book 'Growing Up Super Average'. We also have news on the all-new 2008 'Odyssey' Calendar! Sept. 19, 2007: FREE Adventures in Odyssey episode - "Welcoming Wooton"
Odyssey's favorite mailman comes to town in this hilarious half-hour adventure. At the end, don't miss out as comedian Torry Martin--who helped create Wooton--talks with producer Marshal Younger about Wooton's origin and other little-known facts. 'Adventures in Odyssey' producers are back to answer YOUR questions. Plus, a 2-minute preview of the new season which begins September 15! The premiere episode "A New Era" picks up right where the latest CD set 'Moment of Truth' left off. The new album 'Moment of Truth' is out now, and we've got exclusive bloopers and other details! Also, actor Jordan Orr reveals the story of his 'Adventures in Odyssey' audition and how he's like "Grady." Aug. 08, 2007: FREE Adventures in Odyssey episode - "Broken Window"
When a window gets broken at Whit's End, where will the blame fall? Connie serves as judge in a seriously funny trial that features Rodney, Sarah and Mitch, with a lesson on judging others. After the free episode, go behind-the-scenes with writer Kathy Buchanan and director John Fornof! July 25, 2007: Interview with actor Will Ryan, the voice of "Eugene"! He's provided the voice for 60 different characters in Odyssey, but you know him best as the voice of eccentric brainiac "Eugene Meltsner"... actor Will Ryan tells all! Also includes news of a special Call-In show coming soon. July 11, 2007: FREE Adventures in Odyssey episode - "Over the Airwaves"
When Matt Cartwood and his family move from the South Spoon Ranch, can they trust their tennants to take care of the ranch? Hear this Western Adventures in Odyssey episode. In addition to the free half-hour show, writer Paul McCusker talks about the creation of this show and Kids' Radio. With clips and behind-the-scenes insights, find out how a complex "fire from Heaven" scene is created. Plus, learn how you can get a new Adventures in Odyssey Celebrating 20 Years t-shirt! June 13, 2007: FREE Adventures in Odyssey episode - "Hidden in My Heart"
What do Laffie the Wonder Dog and science-fiction show "Star Trip" have in common? They're TV show spoofs as only Odyssey can do! In addition to the free half-hour show, writer Marshal Younger recounts all the fun of creating this comic episode. May 30, 2007: The Producers answer, "Where do story ideas come from?" and more... plus, Visit the real Whit's End! "Will Wooton get married?" "Is a new Odyssey guidebook coming?"... just a couple of the questions that 'Adventures in Odyssey' producers answer in this podcast, also with hints on upcoming Fall 2007 shows. Jesse and Bob stop by the real Whit's End in Colorado Springs--a fun destination for your family vacation! May 16, 2007: Actor Dave Madden ("Bernard") Reveals His Life on "the Other Side of the Glass"
Window washer Bernard Walton has been in dozens of 'Adventures in Odyssey'... now, just as the Spring 2007 season finale begins, voice actor Dave Madden tells all. May 2, 2007: Hear from Jess Harnell how his character "Wooton" came to life! In this exclusive interview, actor Jess Harnell tells how he started with 'Odyssey', performs a few of his other fun voices, and more -- with clips from our 'American Idol' spoof "Odyssey Sings". FREE Adventures in Odyssey episode - "A Cheater Cheated"
It's another free half-hour adventure, this one starring Cryin' Bryan Dern and swindler Bart Rathbone--who becomes an intern at Whit's End! Get this episode and 11 others in 'A Date with Dad (and Other Calamities)'. Apr. 18, 2007: Marshal and Stephanie Younger share their story of foster care, plus an 'Odyssey' intern gives a behind-the-scenes scoop! A recent 'Adventures in Odyssey' intern tells what it's like to work with the team and write a script from scratch. Then, Marshal Younger and his wife Stephanie share about their family's choice to care for foster kids... and how that inspired the story of new 'Odyssey' character "Kelly." Part 3 of three-part questions-and-answers session with 'Adventures in Odyssey' sound designers... they answer questions on favorite sounds, hardest sounds to create, and why episodes have commericals. Actor Walker Edmiston (1926-2007) has performed as "Tom Riley" and dozens of characters since 'Adventures in Odyssey' began. Tune in as Steve Burns, Chris Anthony, Katie Leigh, Paul McCusker and others remember their dear friend. Mar. 7, 2007: TV's Rachel Fox talks about Joining 'Odyssey' - plus Bloopers from 'Into the Light'! After some exclusive clips from the new release 'Into the Light', we speak with the voice of new 'Adventures in Odyssey' character "Kelly". Plus an important bit of news. FREE Adventures in Odyssey episode - "Amazing Grace"
Enjoy the half-hour story of John Newton in Odyssey's "Amazing Grace" episode. Our hosts for The Official Adventures in Odyssey Podcast also talk about how to learn more about Radio Theatre's Amazing Grace, and the film. Feb. 7, 2007: Interview with the Voice of "Liz," plus Journey on the Underground Railroad! Actress Lauren Schaffel ("Liz") talks about her own adventure of heading off to college, her favorite Odyssey stories and what Liz should do in the future. Plus, Paul McCusker gives a behind-the-scenes look at our Underground Railroad Pack and Radio Theatre's Amazing Grace. Jan. 24, 2007: Actor Bloopers, Exclusive Preview of New Episodes, and more! "The 3 Musketeers" as they say -- Jonathan Crowe, Christopher Diehl and Nate Jones -- are back to answer more of your questions. Plus, an exclusive preview of 'Eugene Sings!' with 17 fun songs by (who else?) Odyssey's ukelele musician Eugene! Longtime writer Paul McCusker talks about "The Lost Episodes" 4-CD release, featuring Adventures in Odyssey shows never-before-available. Also, we hear from composer John Campbell about the evolution of our music theme. Sound designers Jonathan Crowe, Nate Jones and Christopher Diehl, from the Adventures in Odyssey and Radio Theatre team, answer questions about voice editing, mixing... and advice for starting your own audio drama! FREE Adventures in Odyssey episode - "Peace on Earth"
As our gift to podcast subscribers, The Official Adventures in Odyssey Podcast presents this classic Christmas story with the Barclay family -- "Peace on Earth." Adventures in Odyssey actors Katie Leigh ("Connie") and Mark Christopher Lawrence ("Ed Washington") talk together, plus we hear more insights from Paul Herlinger. Also, WhitsEnd.org/Christmas is open for Christmas giving! Nov. 15, 2006: The voice of Whit, Paul Herlinger, tells about his early days in acting. Paul Herlinger takes us back to his early days in TV and radio. Plus, author Paul McCusker reveals why fans won't want to miss the Adventures in Odyssey Novels. Fan questions (submitted at WhitsEnd.org/Podcast) are answered by Producer Marshal Younger and Executive Producer Dave Arnold, including details on why kids leave Odyssey, how old Mr. Whittaker is, and if the website's "WonderWorld" section will be back up. Katie Leigh talks about her mission trip to Peru, reminding her of Adventures in Odyssey's interactive games set in Peru. Plus, actress Aria Curzon discusses being a Christian in Hollywood. Oct. 4, 2006: Producers answer, Why discuss divorce in Odyssey? Executive producer Dave Arnold and producer Marshal Younger answer fan questions about the Fall 2006 season of Adventures in Odyssey, including reasons for dealing with divorce, details on Eugene's search for his dad, and previews. Actress Courtney Brown talks about playing the role of Tamika. Plus, producer Marshal Younger takes us behind-the-scenes of the latest Adventures in Odyssey release 'A Date with Dad (and Other Calamities)'.